List Rules Vote up the Easter Eggs that have you in your feelings. No stranger to viral videos - or viral anything, really - Drake unleashed another surefire smash with the "In My Feelings" video. 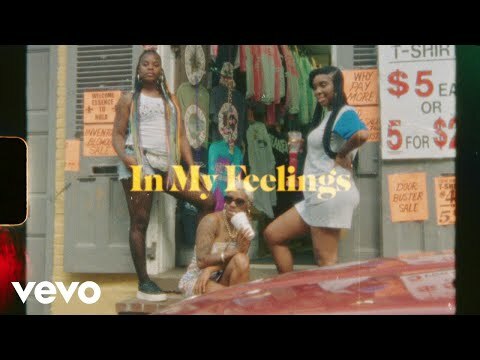 Made infamous by the #InMyFeelings challenge, "In My Feelings" details Drizzy's infatuation with a girl and the way she makes him feel; he also references other girls including Jennifer Lopez, rap duo City Girls, and model K'yanna Barber. "In My Feelings" comes off one of 2018's biggest albums, Scorpion, and catapulted to number one on the Billboard Hot 100 weeks before he released the video. You should expect this MV to keep it there a little while longer, especially with all the fascinating and sometimes even hilarious cameos in the "In My Feelings" video. If KeKe ever doubted Drake's feelings for her, she surely shouldn't anymore. Drake and director Karena Evans shot the video in New Orleans, the home of bounce artist Big Freedia, who is sampled in the song. Over the course of the video, legions of fans dance and party along to the rapper's latest hit, turning the city into one large "In My Feelings" party. Eventually, viewers learn this all happens to be a dream, with Drake waking up in his trailer, reeling from the experience. It only trips him out further when he sees someone from his dream appear at his trailer door asking him to come to set. Does this make you feel things? Of all the celeb cameos in "In My Feelings," the most impactful is probably Big Freedia. The New Orleans bounce artist gets sampled by the biggest artists around including none other than Queen Bey herself, yet appears in few if any of these artists' videos. In fact, you hear her voice before anyone else's in the "Nice For What" video, yet you never get a visual. This phenomenon inspired many think pieces on the erasure of Big Freedia, who finally gets a well-earned appearance in "In My Feelings," if only briefly. The "In My Feelings" video begins with Drake showing up in KeKe's yard, where he tells her he loves her. Played by Power's La La Anthony, KeKe looks slightly unimpressed by Drizzy's efforts, yet seemingly more amused than her mother, played by Phylicia Rashad. Mom feels no sympathy for the rapper and orders him off her front yard, which he eventually leaves because no one disobeys Clair Huxtable. A mural of New Orleans's own Lil Wayne appears in striking detail in the video, a nice homage to not only the city but also to Cash Money Records.